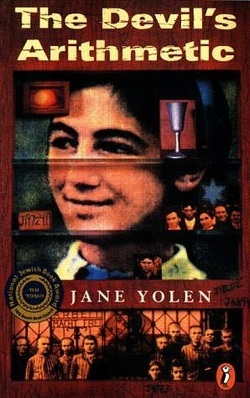 This historical fiction novel was published in 1988 but still appeals to children looking for a story about the Holocaust. Hannah, a 12-year-old Jewish girl in present day New Rochelle, New York, resents having to spend her Passover Seder with her family, especially her Grandpa Will who embarrasses her with his tirades about the Holocaust and the Nazis. During the dinner, Hannah time travels back to 1942 Nazi-occupied Poland to relive the days when the village she finds herself in is rounded up and sent to a concentration camp by train. She slowly loses her memory as she takes on the persona of Chaya, a friend of her Aunt Eva, who she met in the camp. Life for the Jews in the concentration camp is chronicled. Chaya offers the ultimate sacrifice in the camp and, as she heads to the gas chamber, Hannah time travels back to her home and to the dinner she left. As the book starts out by saying, this is a story about remembrance. The time travel aspect might seem strange, but if anyone can make it work, Jane Yolen, who is known for her fantasy books, can. The details are meticulously worked out so that it almost seems plausible that a girl could return to a Nazi death camp just by opening up a door. Suitable for middle school children. Many Yiddish words are incorporated throughout making the vocabulary a little difficult to read, but this book is also available as an audiobook if you would prefer to listen to it instead. 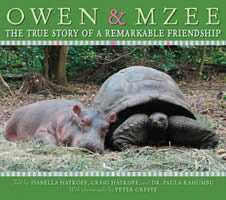 "This is the true story of two great friends: a baby hippopotamus named Owen and a 130-year-old giant tortoise named Mzee." Told in picture book format, the reader learns how these two animals, one a mammal and one a reptile, became unlikely friends. It is a heart-warming tale that is set in Africa. Following a tsunami in 2004, Owen becomes separated from his mother and the hippo pod in which he lives. After his rescue, Owen is moved to an animal sanctuary in Kenya where he bonded with the giant tortoise. Beautiful photographs accompany this story that show how the pair interact with one another. Children ages 3 and up will be captivated! I really enjoyed this one! This is the first book in the Children of the Red King series, where 11-year-old Charlie Bone attends Bloor's Academy "for gifted children." He has recently learned that he has the gift of hearing people in photographs, which delights his sour grandmother since she might be able to use it to her advantage. 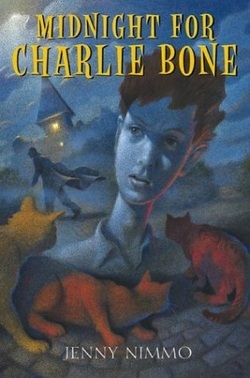 There are several subplots (Charlie's missing father, little Emilia Moon who has been kidnapped, and Manfred Floor, the sinister head boy who can hypnotize anyone who looks into his eyes) but the fantasy series follows the chosen "endowed" children who all have various gifts and, ultimately, leads to a great battle that was started long ago by descendants of a powerful king. Harry Potter fans will enjoy this series, as well as middle school fantasy fans. This series is wonderful to listen to as an audiobook as well. This is by the same author who wrote the Artemis Fowl books as well as "The Supernaturalist" and "The Wish List" which are extremely popular with the middle school crowd. 12-year-old Fletcher Moon, known as Half-Moon because of his short stature, has earned his detective badge making him the youngest detective in his Irish hometown, if not the world. He is hired by 10-year-old April Deveraux to find out who has stolen a lock of a rock star's hair she had bought on E-bay. The investigation points toward Red Sharkey from the Sharkey family notorious for thievery, but through a series of twists and turns, Fletcher finds himself implicated in a much grander crime including arson. This mystery has much humor and kids will enjoy following the clues to try to solve the case themselves. There is sure to be a sequel. Recommended for both girls and boys in grades 4-8. 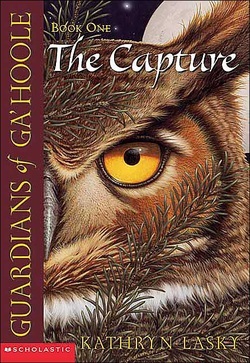 This book is the first book in a series that features all species of owls as the primary characters. The reader is first introduced to the Barn Owl Soren who lives in a nest with his brother, sister and parents. The owlets learn about the legends of Ga'Hoole and enjoy special owl ceremonies like "First Meat" and "First Fur". When Soren falls out of the nest while his parents are hunting, he is snatched by the evil owls of St. Aegolius Academy for Orphaned Owls and taken there. The chicks there are "moonblinked" (brainwashed) and serve some mysterious purpose for which Soren and his friend, the Elf Owl Gylfie, try to decipher as they wait for their feathers to come in which may allow them to escape and warn others. The reading of this book on CD is wonderful. Reader Pamela Garelick is able to switch voices between characters effortlessly and each is unique and distinguishable. I would recommend listening to this one in the car! This series of now 11 titles would be suitable for both girls and boys in grades 4-8 who enjoy fantastical adventures. Chock full of owl behaviour as well, owl enthusiasts would also enjoy to follow this original tale. 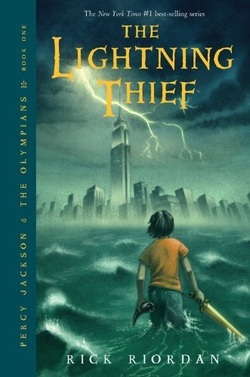 This is the first book in a new series entitled "Percy Jackson & the Olympians." 12-year-old Percy returns to New York City for summer vacation where he lives with his mother and poker playing, beer guzzling stepfather, Gabe, following a year in private school where Percy is pretty sure that he has turned one of his teachers to dust. When Percy and his mother leave for a trip to the Long Island shore to stay on the beach, strange events begin to occur that force them to attempt to reach Camp Half-Blood. Percy manages to escape, but only after seeing his mother get killed by a minotaur. The camp turns out to be for the offspring of the Olympian Gods, where they train to fight off the monsters outside in the real world. Percy doesn't quite believe that he is the son of a God, and it hasn't been determined which God is his father, until he discovers he has powers while in the water. As a son of Poseidon, Perseus is sent on a quest to Hades that would prevent a major war between the Gods. Persy agrees to go, along with his friends Grover, a satyr, and a daughter of Athena named Annabeth, but only because he thinks he can bring his mother back. Full of mythology, this is an exciting and unique adventure for kids in grades 4-9, especially those waiting for the next Harry Potter book to come out. "The Sea of Monsters" is the second book in this series. 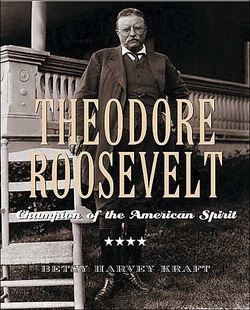 This is a well written and easy-to-read biography of Theodore Roosevelt crammed full of details of his life and accomplishments from early childhood until his death in 1919. A very charismatic character his daughter referred to as "the bride at every wedding and the corpse at every funeral", this book will overwhelm you with the amount of energy and drive Roosevelt possessed. What I found interesting was that it shows how contradictory his life was. For instance, despite his priviledged upbringing, he chose the "lowly" profession of politics as his way of life. Despite being a huge advocate for conservation and nature, he was a huge hunter. He was a Republican that often alienated his party and fought against the very people that helped him attain office. It uses photographs throughout and includes a table of contents, timeline and index. Suitable for children in grades 5-12. This book was originally published in German and translated into English. This ghost story takes place in a small town in Maine. Vicki, a 12-year-old girl, is spending her summer waitressing in her father's must-see tourist attraction restaurant, Ye Olde Seashell Room, that has seashell covered walls and a two-hundred-and thirty-year-old figurehead from the lost ship named Storm Goddess on its' wall. She befriends Peter, a tourist of her age, and strange things immediately begin to happen. The bay turns dry one night and the ghost ship appears fully intact. While the mayor sees opportunity for more tourists to come to his town, Vicki and Peter see ghosts and the need to solve a mystery that involves a hanged man and a curse. Both girls and boys in grades 4-6 will enjoy this plot filled with pirates and gold. This book was originally printed in French before being translated into English. 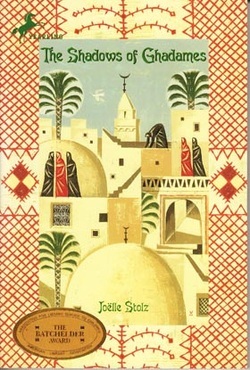 It is set in Ghadames, Libya at the end of the 19th century, a time where women lived on the rooftops of the houses while the men were often in the desert trading goods. The story is told through the eyes of 12-year-old Malika who would like to have some of the same priviledges as her brother, such as reading and traveling, but is unfortunately at the age when she will soon be old enough to be married. This is a slow-paced story that beautifully describes the daily life of Muslim women in an Arab country. The reader will be surprised to see how women managed to create their own power and show remarkable cleverness depite leading traditional roles in the family. This would be of interest mainly to girls in grades 3-5 who like to learn about other cultures and religions. It is challenging to read in that there are many unfamiliar terms and names for an American reader. It is interesting to note that the lifestyles depicted in the book have only begun to change relatively recently. This is the fourth book in the Underland Chronicles. This book picks up where the last one left off. Gregor and Boots regularly visit the Underland as their mother remains below to recover from the plague she contracted in the last book. 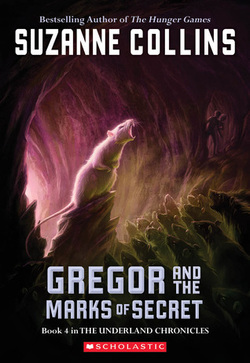 This is the first book in which Gregor is not required to fulfill a prophecy; however, he and Boots both end up in another adventure in the Underland. This time, the crown of Queen Luxa is returned to her by the “Nibblers”, the giant mice of the Underland, which is a signal to her that something terrible has happened and they need her help. As she and Gregor investigate what the Nibblers may need, they discover that all the mice have moved from the places where they live, presumably by the “Gnawers”, the rats. They have managed to leave a secret mark behind which indicates death to whoever finds it. As in the other books in this series, there is a strong anti-war message, but the violence never stops. Gregor is often questioning his actions, such as his identity as a “rager”, his unconscious fighting ability in which he is told it looks like he is smiling and even enjoying the battle. Can he really be enjoying it if he is against killing? The continuing Underland adventure will still appeal to those following this series. Another upcoming prophecy is mentioned, so there is little doubt that there will be a sequel. I would recommend this title to those who have read the first three books in the series. If you are looking for a good fantasy series that is appealing to middle school boys in particular, this is a good one, but it is necessary to read the books from the beginning to understand the storyline. I think I enjoyed this one better than the first book by Blue Balliett, and I loved it! The same characters from “Chasing Vermeer” appear in this latest art mystery, this time surrounding the Robie House in Chicago built by the famous Frank Lloyd Wright. The house is in very poor disrepair and scheduled to be dismantled into sections and divided among three museums. Ms. Hussey, the 6th grade teacher, convinces her students that they must try to save the structure by generating some publicity and, presumably, millions of dollars needed to restore it to its original glory. 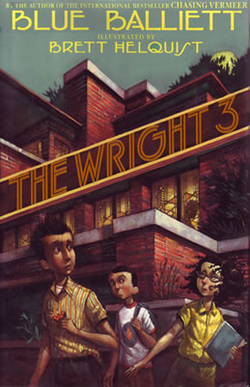 Sleuths Calder, Petra, and Tommy form an alliance and noting all coincidences, use their individual skills of code breaking, writing, and collecting things, to figure out how they may be connected and in turn save the Robie House. The author has such a knack at filling the story in with details and creating great characters and a sense of place that the reader cannot help but become consumed by the story. Full of references the reader will want to investigate and codes they will need to break, this fast-paced and clever book will be a hit on many levels. Would make a great read-aloud and book for discussion. Suitable for kids in grades 3-6. I highly recommend this book!